On with the obscurities… I picked this up after checking out a snippet of it which turned out to be from a different record. Ah well, this EP ended up being a decent slab of wax too. The B side (featured here) is a nice laid back breakbeat techno track, well arranged and tasteful. I kind of err on the side of posting more raging tracks on this site… heavy on the mentasms, crazy beats, and hands-in-the-air piano lines. This track has none of those, but is still a nice early tune that I’d definitely throw in a set. 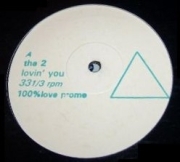 The A side (“Lovin’ You”) is a weird, almost proto-intelligent sounding remix of Minnie Riperton “Loving You” (“Loving you… is easy because you’re beautiful…”). Not sure what I think about that one yet, but this tune is solid! Nice beat, although the vocals are not really my cup of tea.